Have you seen this thing? Looks like R2D2 went all metrosexual. Man, that is slick. Day spa for robots. Robospa. A rice cooker. 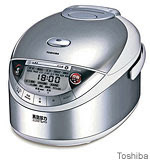 Just a cool-looking rice cooker. Wait! It's an $830 Toshiba rice cooker. So it must be special, right? Yup. It's built with pressure-vacuum technology (and if that doesn't sound like a contradiction to you, you weren't paying attention in physics class). It gets better. The machine is built from materials that include not only silver, but diamond dust. See, it's all about heat, and absorption, and tenderness, and sweetness. It just better turn out diamond-dusted rice. Rice is a girl's best friend. I prefer it stovetop. But I did get a rice cooker from my mom bc I asked for it. Don't tell her I don't use it. Much. Woah Nelly!! No way I'm spending those bucks. Especially since I don't even really like rice. How much rice does it cook? I'm worried that I'm getting a bit out of touch. I saw a $6,000 barbecue grill the other day.... Who would do that? I cook my rice in a 25 year old saucepan and my grill uses (gasp) actual real charcoal - not those wimpy briquettes, but the real messy, thing. Sometimes we use (double gasp) wood. Biggestmenu.com--the Food Friends' Network--is giving out a Free Meal EVERYDAY for the most licked dish! Meet New Friends and Eat FREE! I remember cooking rice after school (for dinner, we were latch-key kids) in a clay pot. Can't count the number of times I forgot to watch it and the rice burned. I had a rice cooker a few years back (admittedly, it was not THIS Ferrari-of-rice-cookers), but I only used it once or twice. If I had it now, I'd probably use it more often, especially since my regrettable electric range is quite fond of burning things. My mom uses a pressure rice cooker as well (not that expensive). It's not just for rice though, Koreans often mix rice with beans and whole grains. The pressure cooker let you cook even beans without pre-soaking in record time. For just rice, a pressure cooker is generally overkill. A friend of mine once told me that he could tell I wasn't a rich man's daughter, because I love the sexiness of things like this but just can't bring myself to spend that much moolah when I cook just as well with an existing pot. My design side drools but my cheap side shakes her head. I think I'll stick with my loudspeakers that look like R2D2. I'll stick to my 'rice boy' or more usual these days a pan on the hob!! For $830 USD I'll come to your house and cook rice. Damn, what a bargain -- and (believe it or not) I bought a rice cooker yesterday to replace my decades-old one that had finally kicked its bucket, as it were. But I paid less than $30 for a model that adapts to brown rice too, and can be used as a steamer as well. Ha. Abby: Stovetop rice-cooking has always been my downfall. I've had guests laugh at my rice. So a rice cooker is OK by me, and I use mine. Dagny: The point of this one is wealthy Japanese yuppies can afford it and are on a quest for the perfect rice. Click through to the WSJ story. It's a hoot. Cindy: I haven't used mine for jook, because I've never tasted jook and don't know what I'm aiming for. Maybe I'll just set the dial to "jook" and take my chances. I want to try it. But: Clay pot? Wow. Jennifer: Our new house is electric range, too. But since the rice cooker was still buried in a box when we first moved, our first meal of rice was -- yeah: stovetop, underdone... eh. Annie: Never heard of pressure cooking rice till now. (And I'm still scared to cook beans in my pressure cooker.) But -- slick!! Pam: I, too, drool. But. Oh, wait a minute. Did you just describe why I'm such a cheapskate, having grown up in family circumstances similar to yours? Dr. Biggles: I mean Reverend. I had a pogo stick that looked like R2D2 before you were born. No, maybe more like C3PO. ChrisB: Rice Boy. Must Google that, though I'm guessing it's one of those $10 deals. Good for you. Kudzu: At this juncture, I suppose I must confess Cranky and I use a kind of pricey Zojirushi model with fuzzy logic! And if I could spring naughty big bucks for that one, you can see why I'm quivering about this one. However, I'm safe. It's probably only available in Japan, and the best rices are also only in Japan. (Click through and read about "Romeo and Juliet" rice.) So there's no point, really. Whew. Saved. I was born? My mother swore at me that I'd been hatched. No, really. Bless you my child. Walk the earth meat friendly all the days of your life. Wow. I still make rice like a bloody USA American... on the stove top in a pot. Rev. Biggles: You weren't born, you were "let." Praise the lord. Lannae: Check with the Reverend (Biggles) before you buy. He's experienced and opinionated in these things. I can put you two in touch if you'd like a proper introduction. He is, after all, a man of the cloth now, and does things properly. Cookie -- Just to prove how I am a typical doting mother, I gave my son a bells-and-whistles rice cooker like your Z baby and bought myself the cheaper model. But he cooks rice almost daily and that high tech machine turns out credible risotto as well as every-day carbs. Kudzu: Risotto? I didn't know that about these things. I should read the pamphlet more closely. But I agree -- we make a lot of rice, too, and it's so easy now. We bought ours in Japantown, and went to a restaurant after. We were so giddy, we showed our purchase to our waitress -- who didn't speak a lot of English. She just shrugged and made two gestures: dump in rice, push button. Big deal. Heh. I no longer will allow myself to feel guilty for dropping the $15 bucks on the rice cooker/steamer combo I bought last year. We use it continually (and I am COMPLETLY incapable of making rice without it. Even in a real "rice cooker" I achieve a strata of crispy on top of a layer of goo) but I still felt like I should have just managed to break my rice curse and cook it on the stove. Is it sad to admit I pay slightly less than that on my car? Jook, or congee as it's called sometimes, I think, should be almost as thick as goodly cooked oatmeal and slightly thinner in consistency, IMO.